NBC Universal and News Corp. joined forces Thursday with several major Internet companies to distribute TV shows, video clips and movies online in an effort to better control their programming and counter competition from YouTube. The new network, which would launch this summer, comes in response to the explosive growth of Google Inc.'s YouTube, a do-it-yourself video-sharing site that is being sued by Viacom Inc., another major media company, for copyright infringement. The venture is aimed at giving broadcasting companies like NBC and News Corp., which owns the Fox broadcast network and the Twentieth Century Fox movie and TV studio, greater control over how their shows are distributed on the Internet. NBC, a unit of General Electric Co., also owns the Universal film studio and several cable channels, including Bravo. 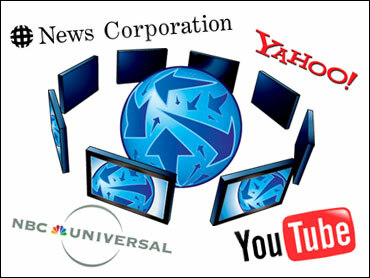 Rather than create one online destination, the shows will be available through a number of Web sites that already receive large numbers of visitors, including Yahoo, Time Warner Inc.'s AOL, Microsoft Corp.'s MSN, and MySpace, which is owned by News Corp.
NBC, Fox and other TV networks have been scrambling to find ways to distribute their shows online in a way that they can control and generate revenue from advertising. Several media companies have experimented with ways to stream video of their shows over the Internet and sell advertising to support it, but no clear business model has yet emerged. This month, CBS Corp. is streaming NCAA basketball games with ads, and Walt Disney Co.'s ABC network streams full episodes of some of its hit shows online such as "Lost," also supported by ads. Several networks also sell downloads of their shows that can be viewed on iPods, televisions and computers through Apple Inc.'s iTunes store. TV programs owned by NBC and News Corp. such as "Heroes," "24," and "House" as well as clips and movies will appear on the new ad-supported online network. NBC and News Corp. say they have already signed up a number of key advertisers, including General Motors Corp., Intel Corp. and Cadbury Schweppes PLC. YouTube allows millions of users to see clips from network shows uploaded by users, but several media companies have fought what they say is unauthorized use of their programming and have demanded that it be taken down. NBC famously asked YouTube to remove unauthorized clips of mock-rap videos from "Saturday Night Live" such as "Lazy Sunday," which had received huge numbers of viewings. In its lawsuit, Viacom — the parent company of Comedy Central and other traditional cable TV channels — says YouTube is encouraging copyright infringement. YouTube says it's protected by law so long as it promptly takes down any copyright-protected material as soon as it's asked to.